your old structures are useless! Lord, Help us to unlearn some things! If we continue asking the same questions we will continue to get the same answers! We need courage to ask the tough questions! Lk 6:27"But I tell you who hear me: Love your enemies, do goodto those who hate you, 28 blessthose who curse you, prayfor those who mistreat you. 1. Do Goodto those who hate you. 2. Blessthose who curse you. 3. Prayfor those who mistreat you. 29 If someone strikes youon one cheek, turn to him the other also. If someone takes your cloak, do not stop him from taking your tunic. 30 Give to everyonewho asks you, and if anyone takeswhat belongs to you, do not demand it back. 31 DO TO OTHERS AS YOU WOULD HAVE THEM DO TO YOU. 32 "If you love those who love you, what credit is that to you? Even 'sinners' love those who love them. 33 And if you do good to those who are good to you, what credit is that to you? Even 'sinners' do that. 34 And if you lend to those from whom you expect repayment, what credit is that to you? Even 'sinners' lend to 'sinners,'expecting to be repaid in full. 35 But love your enemies, do goodto them, and lend to them without expecting to get anything back. Then your reward will be great, and you will be sons of the Most High, BECAUSE he is kind to the ungrateful and wicked. 36 Be merciful, just as your Fatheris merciful. God is kind to the ungrateful and wicked! We become like our FATHER when we become kind to the ungrateful and wicked. Mt 5:43"You have heard that it was said, 'Love your neighbor and hate your enemy.' 44 But I tell you: Love your enemies and pray for those who persecute you, 45 that you may be sonsof your Father in heaven. He causes his sun to rise on the evil and the good, and sends rain on the righteous and the unrighteous. 41 "Whydo you look at the speckof sawdust in your brother's eye and pay no attentionto the plankin your own eye? Why? What is your motive behind the concern for the speck in your brother’s eye? Is it because you genuinely care about the discomfort and pain of your brother? Or, Are you trying to selfishly distract attention from your greater issue? 42 How can you sayto your brother, 'Brother, let me take the speck out of your eye,' when you yourself fail to see the plank in your own eye? You hypocrite, firsttake the plank out of your eye, and thenyou will see clearly to removethe speck from your brother's eye. If you are genuinely concerned about your brother’s painful situation you would deal with your personal plank so that you could be in a position to help him! 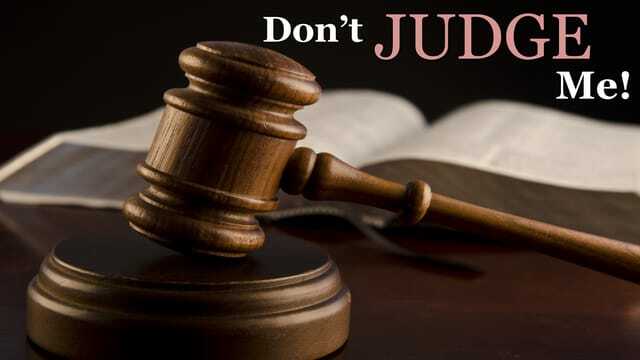 Why are we prone to jump to judgment? Many don’t want to go to church because they feel like they will immediately be judged! God the Father on Judgment Day. Jn 5:22 Moreover, the Father judges no one, but has entrusted all judgment to the Son, 23that all may honor the Son just as they honor the Father. He who does not honor the Son does not honor the Father, who sent him. Even God the Father understands that He does not fully understand what it is like to be human. Therefore, He relinquishes all judgment to Jesus who fully understands our struggle! you've walked a mile in his shoes. Lk 7:36Now one of the Pharisees invited Jesusto have dinner with him, so he went to the Pharisee's house and reclined at the table. 37 When a woman who had liveda sinful life in that town learned that Jesus was eating at the Pharisee's house, she brought an alabaster jar of perfume, 38 and as she stood behind him at his feet weeping, she began to wet his feet with her tears. Then she wiped them with her hair, kissed them and poured perfume on them. 39 When the Pharisee who had invited him saw this, he said to himself, "If this man were a prophet, he would know who is touching him and what kind of woman she is-- that she is a sinner." 40 Jesus answeredhim, "Simon, I have something to tell you." "Tell me, teacher," he said. Jesus asked permission to teach Simon! 41 "Two men owed money to a certain moneylender. One owed him five hundreddenarii, and the other fifty. 42 Neither of them had the money to pay him back, so he canceled the debts of both. Now whichof them will love him more?" 43 Simon replied, "I suppose the one who had the bigger debt canceled." "You have judged correctly," Jesus said. but now you are judging correctly! 44 Then he turned toward the woman and said to Simon, "Do you see this woman?I came into your house. You did not give me any waterfor my feet, but she wet my feet with her tears and wiped them with her hair. Do you see her heart or do you see her reputation? or do you still see her as she was before? 45 You did not give me a kiss, but this woman, from the time I entered, has not stopped kissing my feet. 46 You did notput oil on my head, but she has poured perfume on my feet. 47 Therefore, I tell you, her many sins have been forgiven-- for she loved much. But he who has been forgiven little loves little." compared to the woman’s expression of love! 48 Then Jesus said to her, "Your sins are forgiven." 49 The other guestsbegan to say among themselves, "Who is this who even forgives sins?" 50 Jesus said to the woman, "Your faith has saved you; go in peace." Even Though Simon had experienced forgiveness, he still struggled with his old judgmental habits! Guilt is experienced when God Convicts you of a sinful behavior! Shame is experienced when satan/man condemns you with a false identity! Rom 10:11 As the Scripture says, "Anyone who trusts in him will never be put to shame."